Yesterday Chris Hemsworth himself uploaded the first screenshot of the upcoming MIB: International on his Twitter. 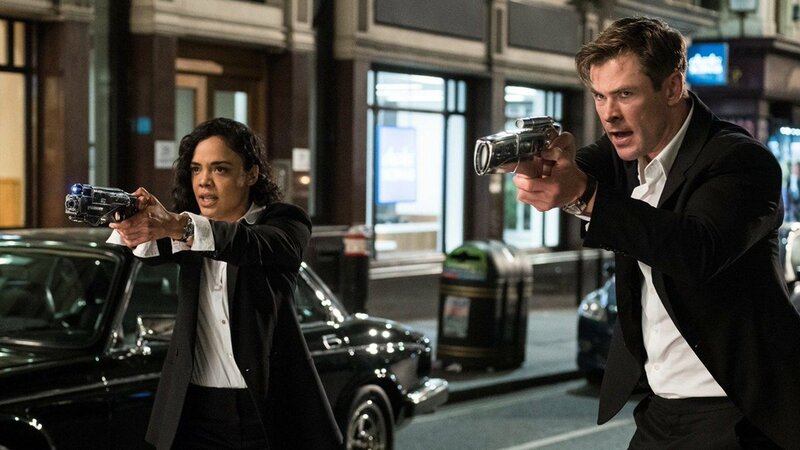 The photo shows Hemsworth as Agent H and Tessa Thompson as Agent M in London with their weapons drawn. Oh those shiny silver laser thingies, how I have missed them. And it is good to see that Sony has kept the original suits and even the watches but there are no neck ties. I am not so sure about that. Another thing I have noticed is how Tessa is wearing her suit, her cuffs are out and so is her shirt collar while Hemsworth is keeping his look very professional so it is not difficult to assume who is the stickler for the rules and who is a free spirit. Filming has already wrapped up in October and post production is underway.The film will be released on June 14, 2019 which will make this either a Summer blockbuster or yet another reboot that didn’t live up to the original. Reboots are not doing well recently, Oceans 8 and Ghost Busters fell under the average category despite having Elite level cast. Hopefully MIB: International will break the curse.